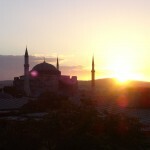 I hope you are enjoying the posts from my trip to Turkey! I have been having fun flipping through photos and thinking about the various experiences. 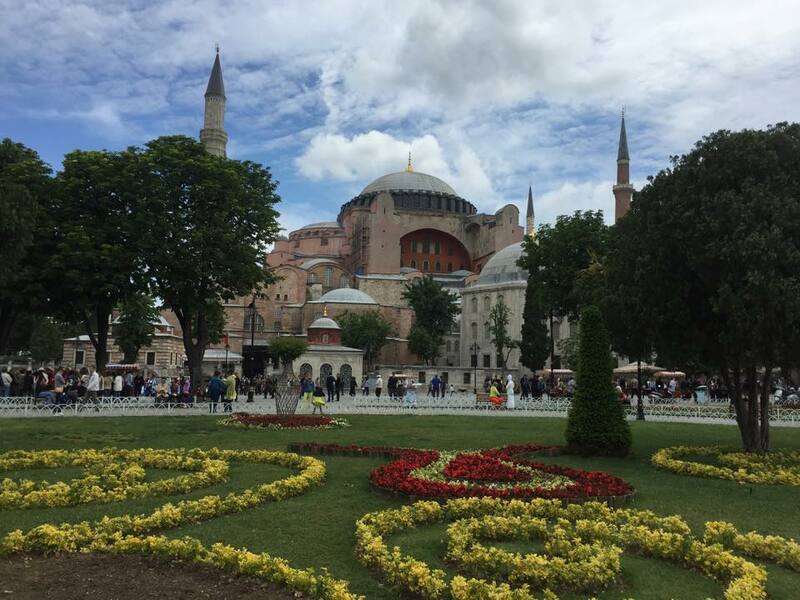 Today, I want to share about my visit to the Hagia Sophia, the church that was the center for Orthodox Christians for centuries. 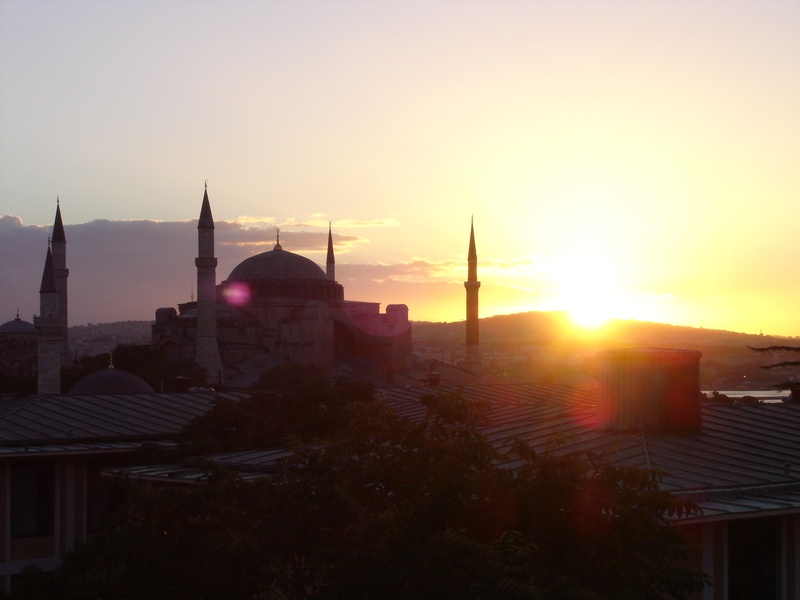 More than a decade ago, when I first visited Turkey, I stayed in Sultanahmet which is the oldest section of town and is dominated by two amazing structures — the Hagia Sophia and the Blue Mosque. Both of the buildings were central to my visit then and I knew I wanted to return to them on this trip. What I didn’t know was I’d end up at the Hagia Sophia (sometimes written as Aya Sofia) twice while in town. 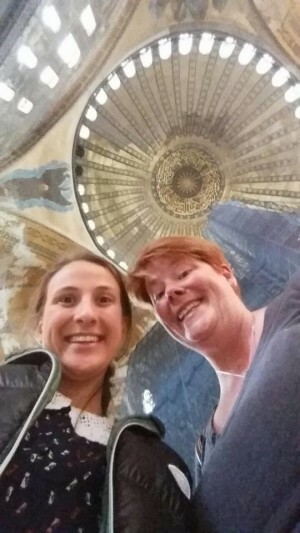 My friend Nilay returned to her hometown of Istanbul several years ago and I was lucky enough to have her showing me around the first few days I was back in Turkey. She figured out that the Big Bus Tour would give us a chance to move around the city pretty efficiently and we’d have a chance to see quite a bit. Since we could get off and on as much as we wanted, I felt compelled to get off at Sultanahmet to see it after all these years. The memories of staying at a very small hotel in that district flooded my mind. 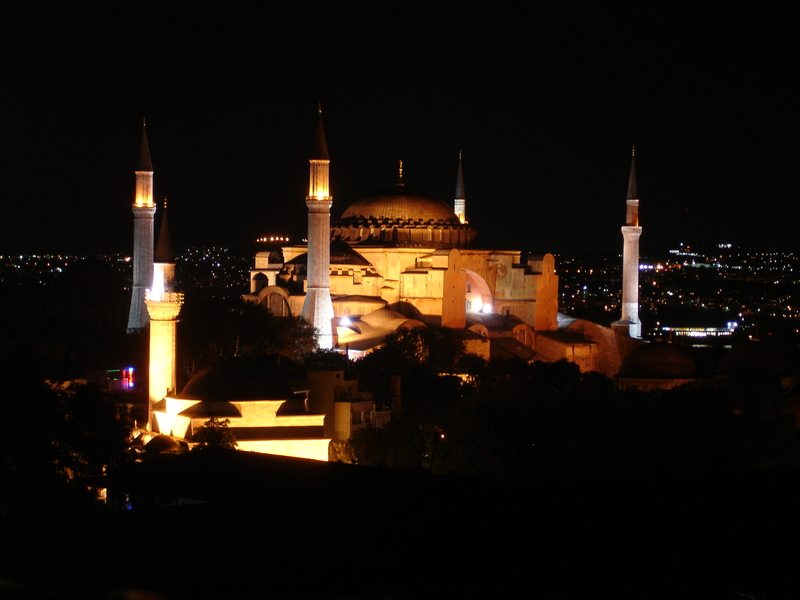 See, when I was in Turkey a few years ago I found the view from my hotel overlooking the Hagia Sophia & the Blue Mosque almost entrancing. Both buildings have the ability to absorb the various colors of light from sunrise to sunset, changing the illusion from the rooftop I would write my journals from. The colors of the buildings would change from silhouettes at sunrise to striking colors to the point the silhouettes were there and suddenly the lights would go on to let you see it through the night. 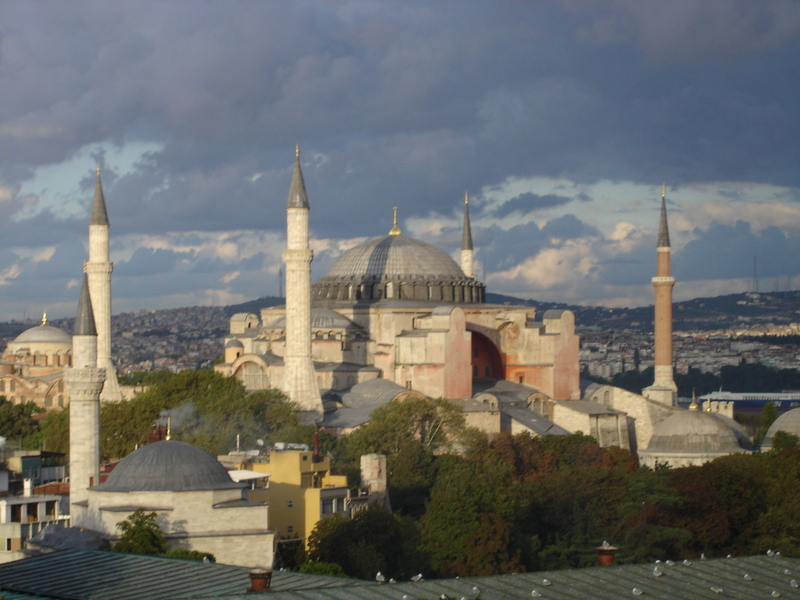 Here are a few of the photos I took of the Hagia Sophia (now a museum) in 2004 but I took dozens (you can click on each thumbnail if you’d like to see a larger version of it). Can you understand how that would not only captivate you while you are visiting a place but require you to get some closer looks when you return? As Nilay and I walked around the area on this visit, I was struck by how beautiful the early summer was, with gardens in full bloom. The images from inside the church that was first built in 500 AD and was the focal point of orthodox religion, began to come to mind as well and I asked her if she’d mind our going inside. I could remember things largely from the photos I have reviewed since that trip. I particularly recalled two gentlemen and some of the religious art. 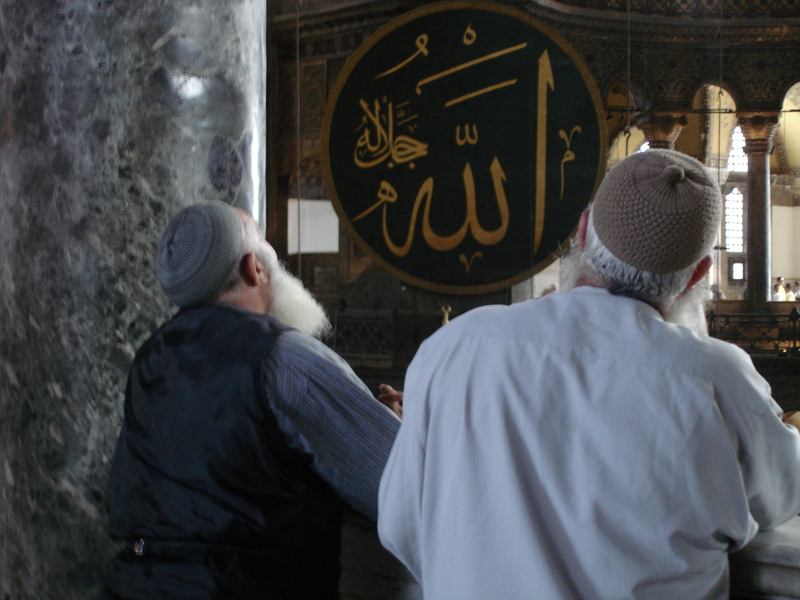 Going into the Hagia Sophia, there is such a strong feeling of place and time that it was surprising then and stayed with me all of this time. As you enter, you go through lines of people, metal detectors, etc but as you cross into the building it self, you begin to feel the past more clearly. 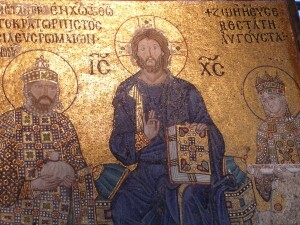 Ten years ago, there was a stark difference for me once inside the church in part because this area of Sultanahmet was a bit overstimulating with many people offering foreigners goods to purchase, strangers approaching you, etc but the Hagia Sophia offered a great break and some solitude. And the view from upstairs is really quite moving. I spent time checking out some of the details…. mosaics and frescos that show the origins of the building, badges that came as religious history moved, gates to some of the passageways, etc. 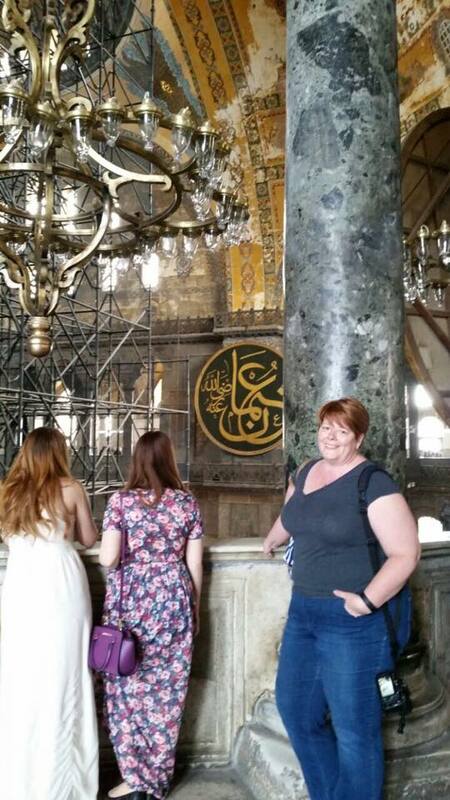 For me, touring it alone was a great way to go as it offered a lot of reflection but I also was able to people watch and seeing the variety of people/cultures that honored the significance of the Hagia Sophia, that was really something that has stayed with me since my visit. 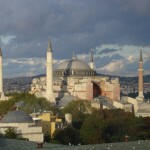 As I said, this time I made two trips to the Hagia Sophia which is a public museum. 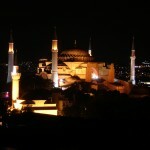 The one from pure compulsion when seeing the city with Nilay, and a bit more than a week later as I toured the city with my friends Kater and Onur who had never been but also felt drawn to see it. This time the building is undergoing another renovation. The best views are from upstairs in my opinion but you need to really spend time downstairs to see some of the most ornate art work. I particularly spent time looking at some of the less obvious paintings that rather than being destroyed as history shifted, simply were painted over. 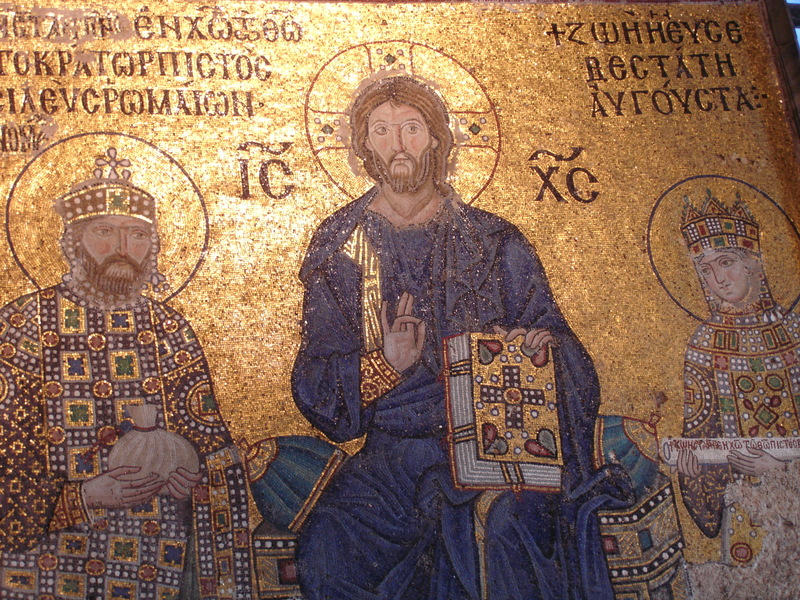 So this cross from Byzantine times of Constantinople slowly disappeared and Ottoman and Islamic influences prevailed in the area that came to be known as Istanbul. Thanks for sharing. I hadn’t seen that but since Turkey seems to shift from one part of the spectrum to the other fairly easily and currently seems more conservative, it isn’t too surprising to me but I truly hope that cooler heads prevail. It was especially poignant to see this after all the various issues in the past few years have resulted in people trashing history, most recently nearby in Syria. Beautiful post, thoughts, pictures. Thanks for the tour. Wish I could go and linger there. I tweeted your post in hopes that others will also enjoy it. Thank you! It truly is a majestic place… so much history and art to absorb.